On Sunday I decided to make a pie for our Sunday Lunch (post to come next Sunday). I also wanted to make something yummy for dessert as a treat. I use egg yolks in my pastry so had a few spare egg whites knocking about that needed to be used up... 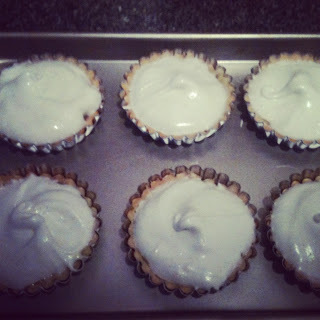 It didn't take me too long to decide to whip up some little lemon meringue pies! Rather than making one huge pie I decided to make a few mini ones, everything is cuter in miniature right? 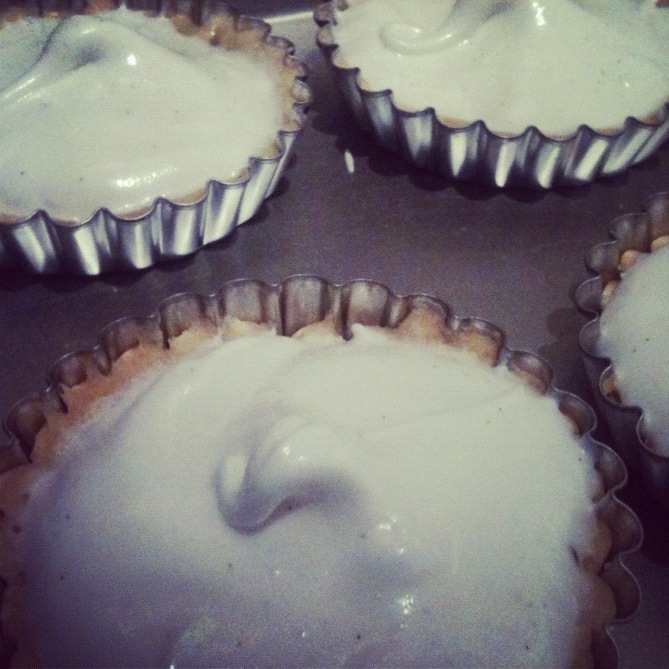 Plus I have heaps of the mini tart tins after my epic recipe development for my recent TV appearance/adventure. Bizarrely every single element of this pudding has been blogged recently by me but as part of different recipes, it just goes to show that if you know the basics you can pretty much create any type of desert! The pastry recipe can be found here. I simply omitted the nutmeg. The curd recipe can be found here. I didn't have any fresh lemons in the house so just used the bottled lemon juice and it tasted just fine, it lacked that lemon-y zing but I quite liked the subtle flavour. The meringue recipe can be found here. I had three egg whites so simply upped the sugar to 150g, if you just think of it as 50g of caster sugar per egg white it works well. I also added a few fresh vanilla seeds which made the meringues taste amazing! I blind baked my mini tart shells for 9-12 minutes, and then assembled. I preheated the oven to 200C and then when I popped the tarts in I reduced the temperature to 160C. I baked them for around 15-20 minutes until the top was golden and crisp to touch. These went down an absolute treat and were even lovely the following day cold! Although when they cooled the meringue cracked and fell a little so if you are making these for a fancy dinner party or tea with the queen make sure you serve them fresh! In fact if you are cooking for royalty or an episode of "Come Dine With Me" I would suggest piping the meringue; much fancier! What is your "go-to" dessert recipe? If you were on Come Dine With Me what would you serve? I am entering this bake into the AlphaBakes Challenge hosted by The More than Occasional Baker and Caroline Makes. This month is brought to you by the letter "L". Thank you so much for your entry. Miniature is definitely cuter and you can feel less guilty eating one or two! 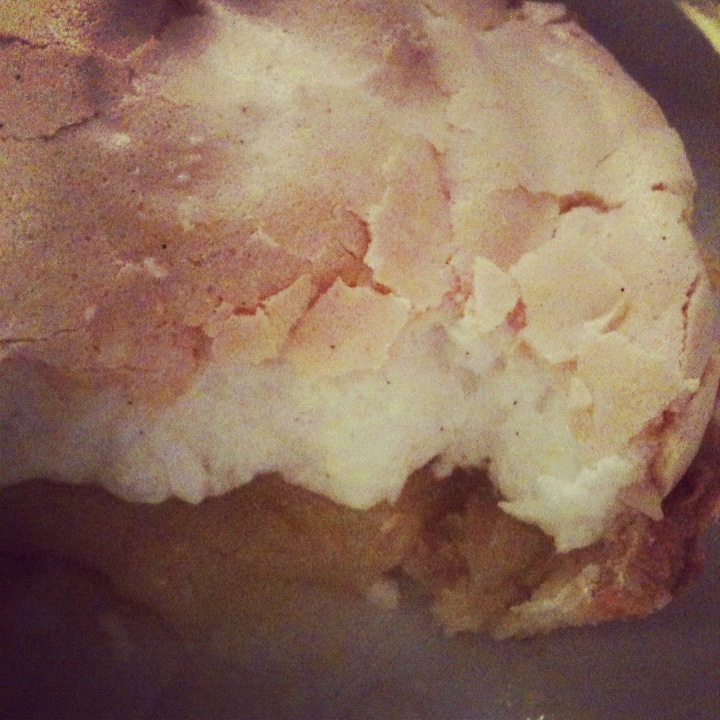 I love lemon meringue tarts although I've never attempted it myself. Look forward to your pie on sunday. I've never tried piping meringue, I might have to do that next time! Thanks for entering Alphabakes and hopefully see you next month! I haven't had a lemon meringue pie for years - it reminds me of visiting my aunt who used to always make it for family parties. They look really cute as minitures.